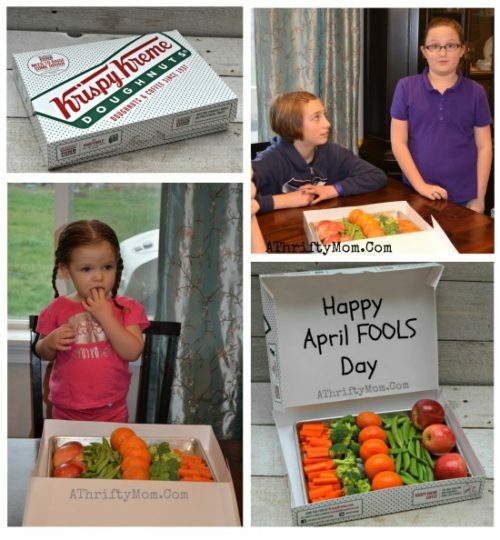 Easy April Fools Prank for kids or co-workers ~ Where are the Donuts? Easy April Fools Jokes that are family friendly! I love April Fools Day, I am always up for a silly prank. We did this one for my daughter and her friends. I told them we would have an after school snack, they were SO EXCITED to see that Krispy Kreme box sitting on the table… pretty sure they would have voted me Mother of the year at that second in time. That is till they opened the box only to see a tray of fresh fruits and veggies inside. Their reaction was priceless… and I totally lost the Mother of the year award, lol. To make this, all you need is an empty donut box and a bunch of fruits and veggies to put inside. Ours was filled with carrots, broccoli, oranges, sugar snap peas and apples. You could so this at the office too, I am sure your co-workers would just love you! Here is a fun list of more April Fools Jokes and Pranks for kids! Edible Painted Bread... a fun idea for April Fools.